The 4 star Southern Comfort Guest Lodge offers 4 upmarket rooms all with modern en-suite bathrooms featuring walk-in glass showers. A private patio leads to a terrace garden and sparkling pool where you can soak up the sun from a pool lounger. Experience a majestic 360 degree view of Table Mountain, Lion’s Head, Devil’s Peak and the Mother City from the large Rooftop Viewing Deck. Our modern and spacious upmarket rooms feature all the modern amenities you would expect from a 4 Star Guest House. Our team at Southern Comfort Guest Lodge are at your service to ensure your stay is comfortable. If you have any special requirements or queries do not hesitate to let us know. Modern bathroom with glass walk-in shower. Towels, Bathrobes and hairdryer available. King Size Bed featuring new mattresses and quality white bed linen. Secure safe to lock away your valuables. Laundry and ironing services available on request. Complimentary bottle of AquaV spring water on arrival, Minibar with great wines available. Tea & coffee is available in the rooms. Microwave and fridge available to guests. Private patio furnished with table and chairs. Sparkling swimming pool with pool loungers for relaxing and tanning. Rooftop viewing deck. Enjoy 360 degree panoramic views of Table Mountain and Cape Town City Bowl. This is what you can expect when booking your stay at the 4 Star, Southern Comfort Guest Lodge in Cape Town, South Africa. 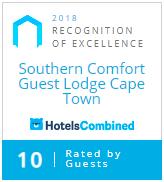 Book your stay at Southern Comfort Guest Lodge now!